An in-depth explanation of the double-digital display. 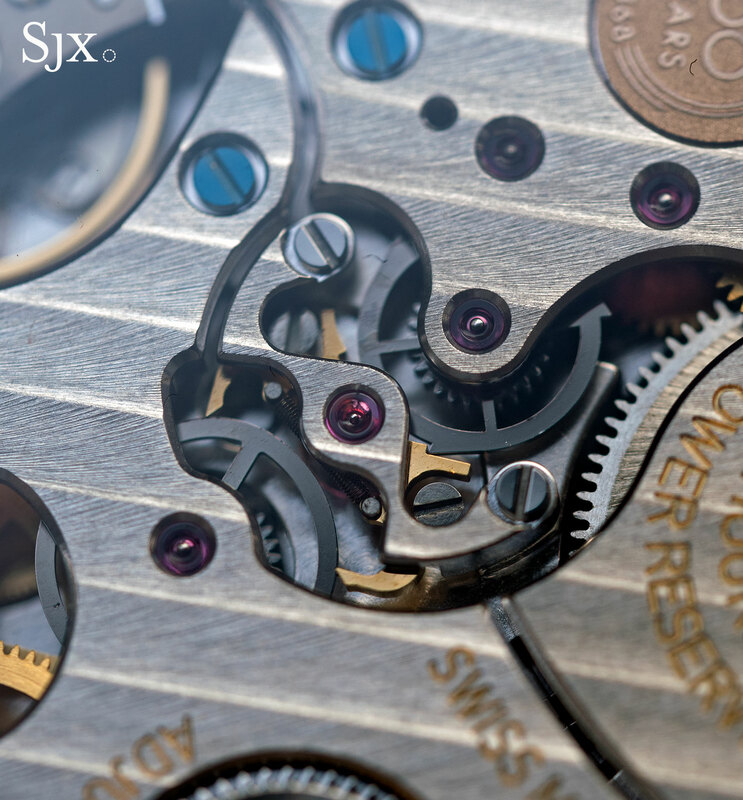 One of the fundamental building blocks of the modern IWC company was its concise and practical-minded approach to engineering movements, perhaps a consequence of being in the German-speaking north of Switzerland, rather than the Francophone, metier d’art-inclined region around Geneva. 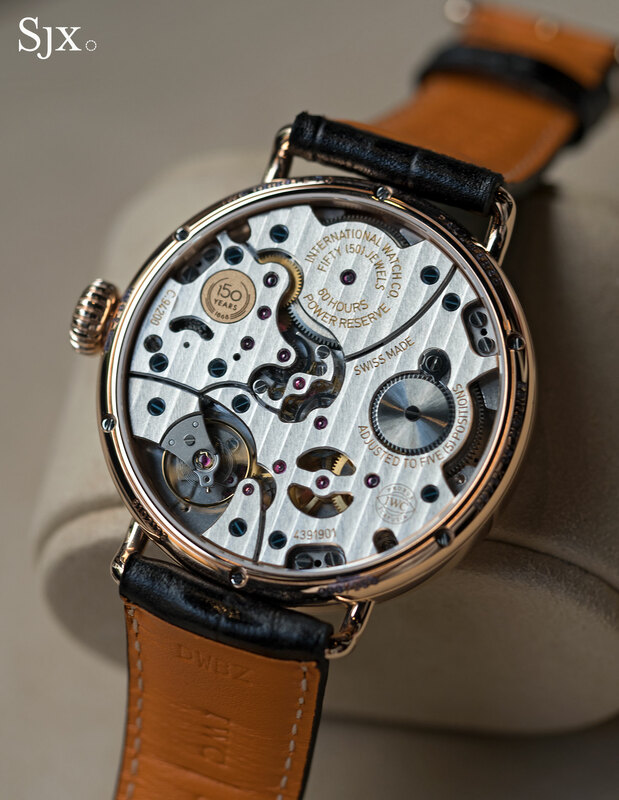 It was a philosophy that went into high gear in the late 1980s when the firm was led by the late Günter Blümlein and his dream team (the best known being Kurt Klaus and Richard Habring), several of whom were also instrumental in developing the early watches at A. Lange & Söhne. The bountiful spell, which lasted till the early 2000s, gave birth to many of the brand’s signature calibres and complications – from the Da Vinci perpetual calendar to the seven-day automatic or even the Il Destriero Scafusia, a magnificent uber-complication cleverly built on a Valjoux 7750 base. Those developments allowed IWC to develop its diverse and robust current collection. But movement innovations became a less frequent in the last decade or so, and some serious-minded enthusiasts could be forgiven for feeling nostalgic. And then came the Tribute to Pallweber “150 Years”, the flagship of its Jubilee Collection. 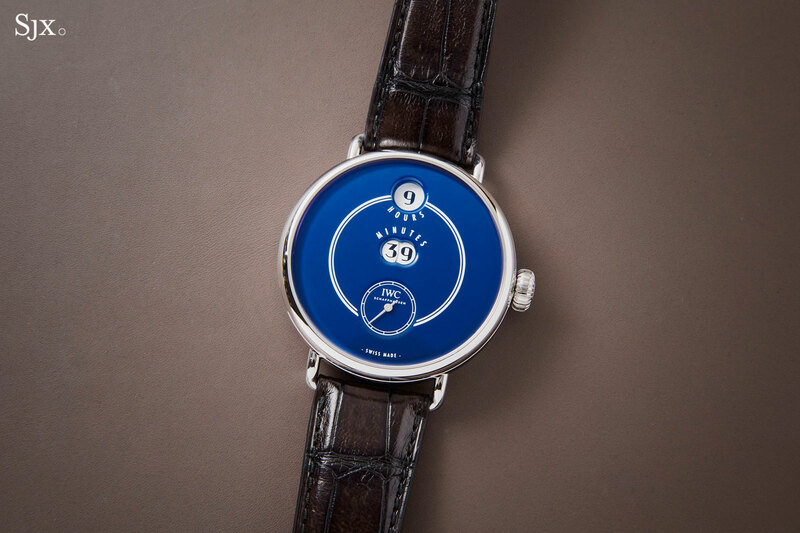 Boasting double digital display with jumping hours and minutes, the Tribute to Pallweber and its cal. 94200 once again adopts the IWC philosophy of smart engineering for affordable prices as such things go – the Tribute to Pallweber in steel costs US$25,000. It’s much like the original Da Vinci of 1985, which was the most affordable chronograph with perpetual calendar on the market; still an expensive watch but the most economical thanks to its inventive construction. 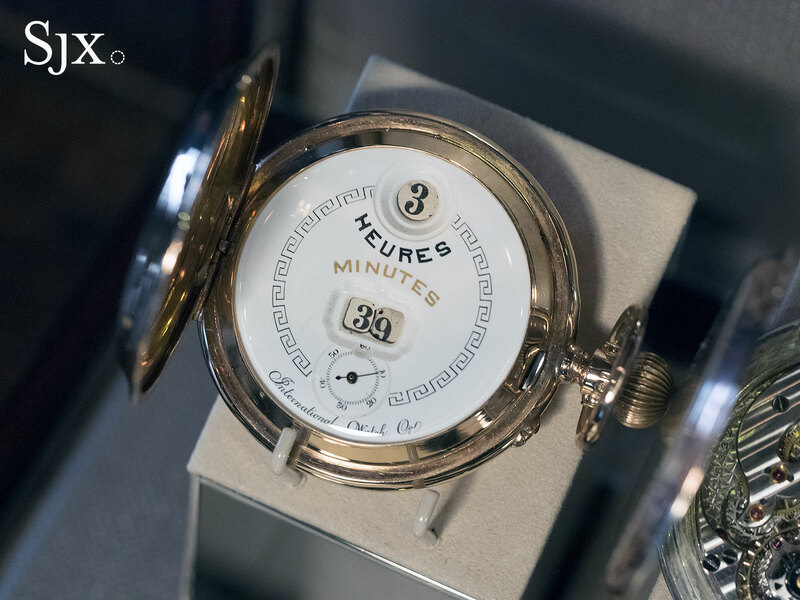 Ironically, the inspiration for the Tribute to Pallweber was a budget-minded timepiece. 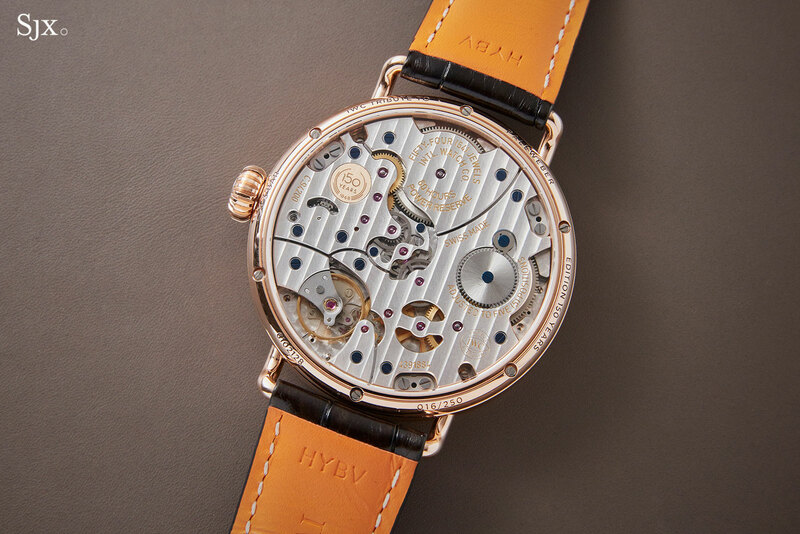 Invented by Austrian watchmaker Josef Pallweber and licensed to several watch brands, though IWC was the best-known adopter, the original Pallweber mechanism was basic. The Tribute to Pallweber had to look the same, but be built to a whole new standard of quality. “The historic mechanism was not able to fulfil the requirements of the technical standard and the expectations of a client today,” explains Stefan Ihnen, the chief of technical development at IWC. And it was also to keep the movement thin. Mr Ihnen adds, “The diameter gave us the opportunity to position all necessary parts on a relative comfortable surface and to keep the height of this complicated movement in a relative good range.” The result is a calibre with the componentsarranged concentrically and spread out, rather than stacked up. In an ordinary wristwatch, a single gear train powered by the barrel powers the entire movement continuously as the mainspring unwinds, with the escapement regulating the release of energy. This results in the steady sweep of the seconds, minute and hour hands across the dial. Digital display watches of the mechanical sort, however, rely on separate discs for the digits of the time display, instead of hands. Unlike hands, the discs have to jump in quick, discrete steps. The Tribute to Pallweber has three such discs – one for single digit minutes, another for 10-minute segments, and the last for the hours – while the seconds are shown conventionally on a sub-dial at six. In terms of physics and mechanics, the biggest challenge is the minute display, as its discs have to jump instantaneously every 60 seconds, a task that creates two problems. First, a relatively high amount of energy is needed to drive the jumping discs compared to the hands in a conventional movement. That was solved with a second mainspring with a secondary, standalone gear train (in red) dedicated to powering the discs. Timekeeping, or power transmission to the escapement, is still accomplished by a separate, conventional going train (in blue). 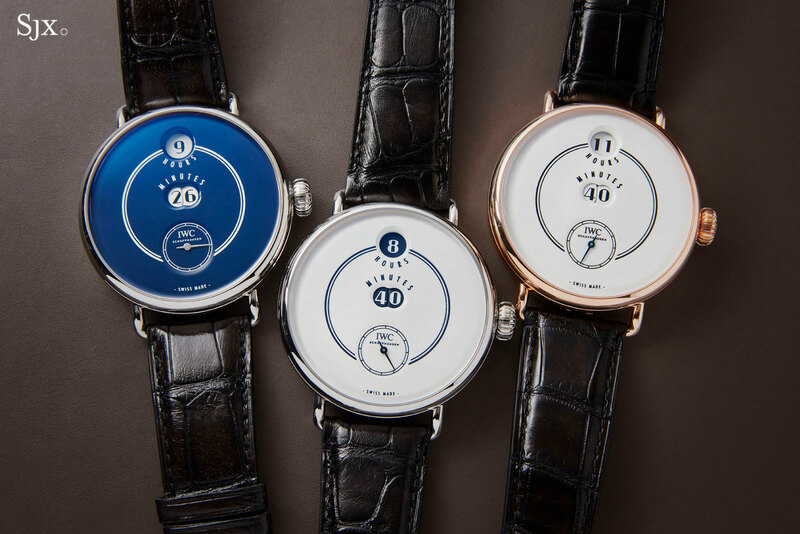 The two-train solution differs from similar watches with comparable digital displays, most prominent of which is the Lange Zeitwerk. While visually similar, the mechanics behind the two are quite different. The Zeitwerk uses a single, relatively large mainspring barrel to drive both the timekeeping and digital discs at the same time. It relies on a constant force mechanism known as a remontoir, essentially a small spring that winds and unwinds rapidly to deliver small doses of energy, to regulate the power required to jump the minutes display every 60 seconds. Built to maintain a near-constant torque to the escapement even when the minute disc is jumping, the remontoir is a more expensive and complex solution, which is one reason why the Zeitwerk is a pricier watch. The Tribute to Pallweber takes a simpler approach, exploiting the large movement diameter to accommodate two large mainsprings. An upside of this construction is the impressive power reserve of 60 hours, putting it ahead of the competition; the Zeitwerk, for instance, has a 36-hour power reserve, while the F.P. Journe Vagabondage III is 40 hours. 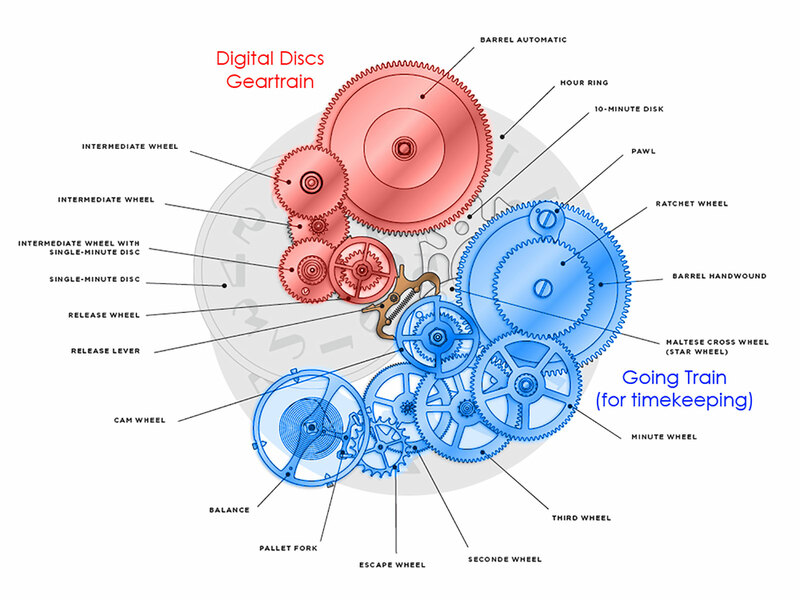 The second conundrum is coordinating the movement of the discs – some form of mechanism is required for the timekeeping train to ensure the digital disc train jumps every 60 seconds. Enter the cam wheel. A cam is essentially a disc with an irregular (as opposed to round) profile, usually paired with a lever (often tensioned or spring-loaded) that runs along its edge. The profile of the cam controls the position of the lever and is typically used to facilitate a sudden jump. Thus, it is often used in complications such as calendar mechanisms and chronograph minute counters. The cam wheel (blue) is continuously driven by the timekeeping train. Meanwhile, the digital disc gear train (red) is locked by a pair of release levers (orange) that are sprung, with a coiled cylindrical spring connecting them (the spring will be familiar to nerds as a key component in another IWC invention, the split-seconds mechanism of the Doppelchronograph). These levers are the sole components that block the power from the secondary gear train, while synchronising its release in regular intervals. The release levers ride along the cam wheel until one abruptly falls when it reaches the step on the cam’s edge. The falling release lever then frees the release wheel (red) momentarily, allowing it to rotate the single-minute disc by one-minute digit. Once the single-minute disc has advanced by one digit, it gets stopped by the other release lever. The process then repeats every 60 seconds. To prevent damage of the release lever’s sharp tips when they drop into the steps of the cam, a set of eccentric screws prevents the levers from falling the full distance, meaning that the tips of the levers do not contact the edge of the cam. 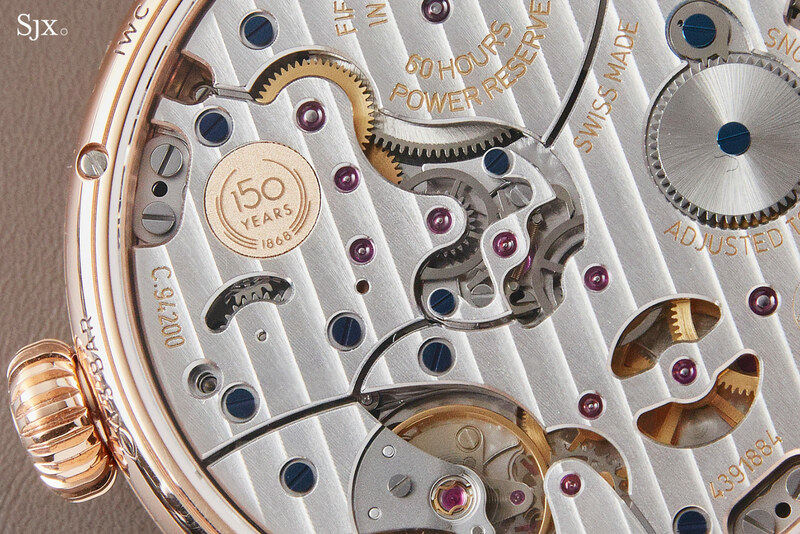 The screws also allow the watchmaker doing movement assembly to fine-tune the tolerances of the release levers’ motion for a more precise jump. While the mechanism above accounts for the single-minute disc, there still needs to be another set-up for the 10-minute and hour discs, which only rotate at regular intervals of every 10 and 60 minutes respectively. Thus, it is mechanically logical that the 10-minute disc should advance forward a step (60°) each time the single-minute discs does a full rotation. Likewise, by the same logic, after the 10-minute disc does a full revolution, it should actuate the hour disc forward by one digit (30°). The trick is getting these discs to discretely jump from one digit to the other in sync. A regular gear train will simply rotate the discs continuously, instead of a crisp jump. 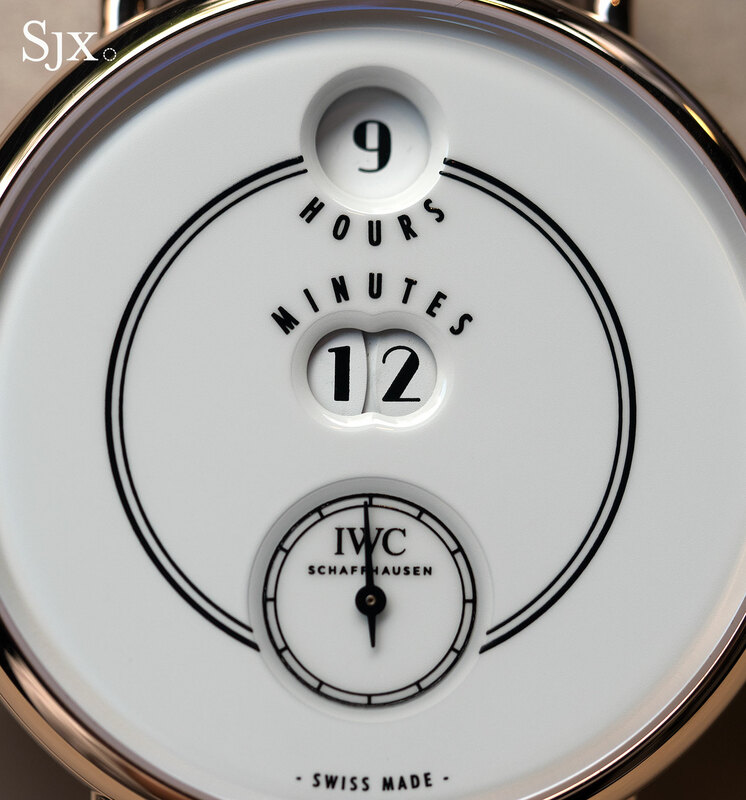 IWC achieved this effect by using a set of Maltese crosses to drive the 10-minute and hour discs. A Maltese cross (also known as a Geneva Mechanism) converts continuous rotational motion into intermittent, stepped rotations. The advantage of using a Maltese cross is that it locks the discs in fixed positions between the intermittent rotation, simplifying the mechanism and making it less susceptible to shocks. In the Tribute to Pallweber, power cascades from a full rotation of the single-minute disc (red) driving the 10-minute disc (green) in a 60° step (e.g. from 29 minutes to 30 minutes). Likewise, when the 10-minute disc does a full rotation, it drives the smaller Maltese cross (purple) which in turn drives the hour disc forward (e.g. from 9:59 to 10:00). Naturally, the transition to the top of the hour consumes the most power since all three discs are simultaneously jumping. This will intermittently impart a high load onto the mainspring – hence the prudent decision to have two separate gear trains. The means the widely varying load of the digital discs gear train will not affect the going train that handles timekeeping. The only extra load on the going train is the relatively small amount of energy required for the cam wheel to raise the release levers every 60 seconds. Everything in the Tribute to Pallweber performs in sync, regardless of the number of discs that are jumping. 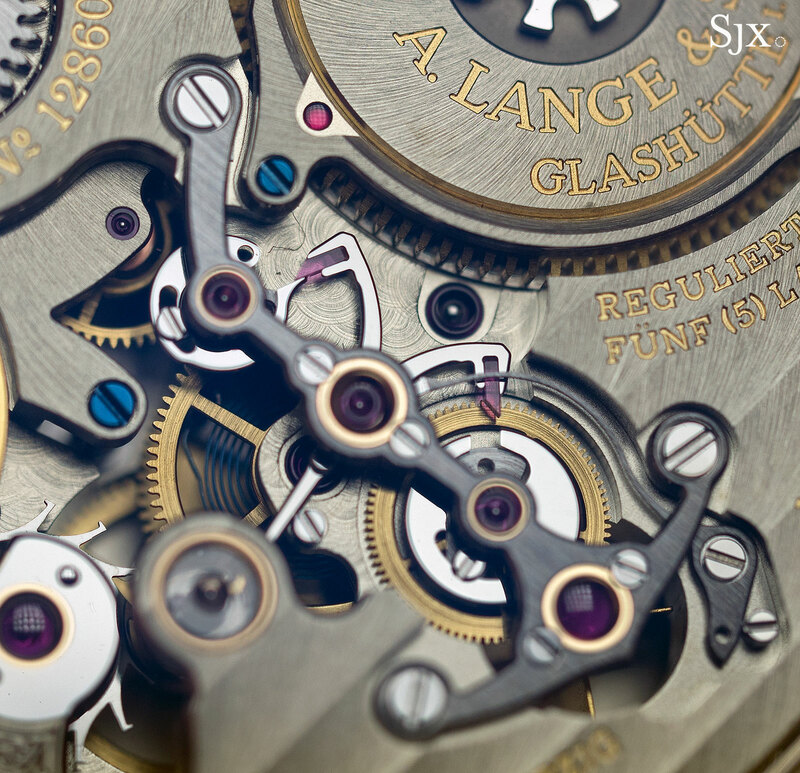 Each time the seconds hand crosses “60”, the discs jump with a tolerance of 0.25 to 0.50 seconds.